AIDS Update 2014 23 Edition AIDS UPDATE 2014 presents a balanced review of current research and information on HIV infection, HIV disease, and AIDS. 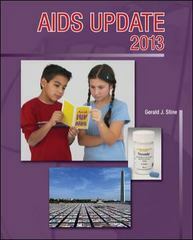 AIDS UPDATE 2014 places this discussion within a biological, medical, and social framework. Unique to this textbook is the historical presentation of HIV/AIDS in terms of dates, times, and locations, as well as the meaning of those events in scientific, political, and social terms.